"A smoky update on the classic baked macaroni and cheese. This would also work with kielbasa as the meat and cooked peas or sauteed spinach (with garlic) as the vegetable. Don't substitute any other cheese for the smoked Gouda. You can sub Ementaller or imported Swiss (Jarlsberg would be great) for the Gruyere. Don't add salt to the sauce. Serve with garlic bread and a side salad." Preheat oven to 350 degrees F (175 degrees C). Grease a 9x12-inch baking dish. Bring a large pot of lightly salted water to a boil; add penne and cook, stirring occasionally, until tender yet firm to the bite, about 11 minutes. Drain and return pasta to pot. Melt 2 tablespoons oil and butter together in a saucepan over medium heat. Whisk flour into hot oil-butter mixture until mixture has a paste-like consistency. Cook, whisking constantly, until flour mixture is light golden, about 5 minutes. Pour milk into flour mixture, 1 cup at a time, whisking thoroughly until mixture is smooth between additions. Cook, stirring constantly, until mixture thickens and coats the back of a spoon, about 15 minutes. Reduce heat to low. Mix Gouda cheese and Gruyere cheese into milk mixture until completely melted; add Pecorino Romano cheese and stir until melted. Stir 1 tablespoon pepper into cheese mixture. Remove from heat. Heat remaining oil in a large skillet over medium-high heat. Saute garlic, pinch of salt, and a pinch of pepper in hot oil until fragrant, about 30 seconds. Add kale; saute until tender, about 15 minutes. 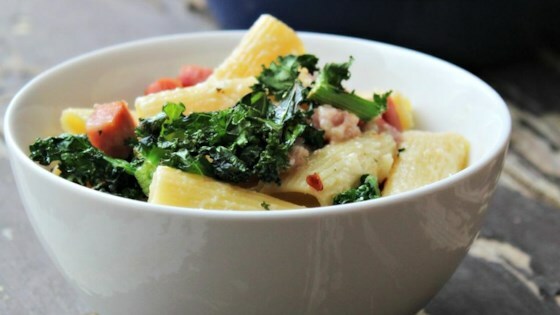 Stir cheese sauce, kale, and turkey ham into penne; mix thoroughly. Pour into the prepared baking dish. Bake in the preheated oven until sauce is bubbling, 20 to 25 minutes. Turn basic pantry ingredients into a creamy, spicy mac & cheese. You can substitute olive oil for the canola oil. You can substitute ham steak for the turkey ham. You can substitute 2% milk for the whole milk. This was awesome! I made it witl rigatoni instead of penne. The gouda was fantastic!! I made this with kale and ham instead of turkey ham.